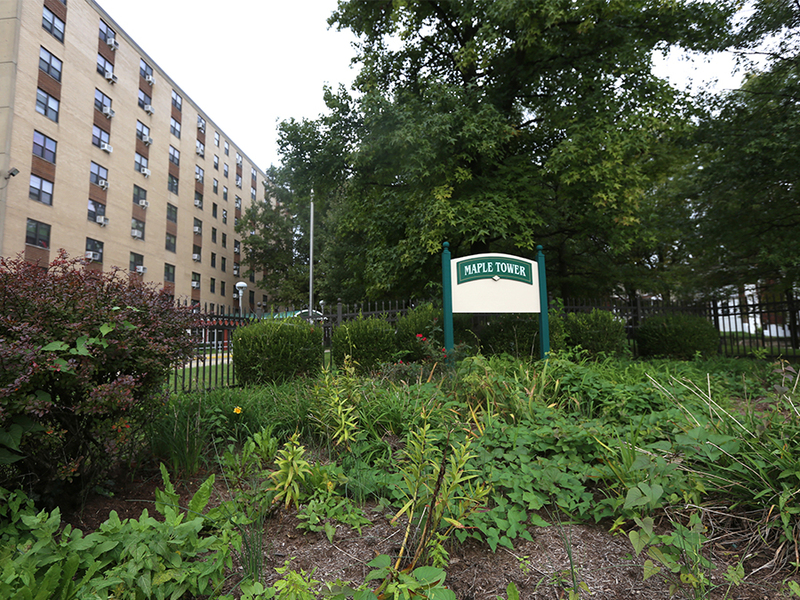 The Cincinnati Metropolitan Housing Authority has made scores of repairs at Maple Tower in Avondale. But residents say there's a new problem. CINCINNATI -- Nearly six months after inspectors from three different city departments found scores of code violations at an Avondale apartment tower, city officials have confirmed the vast majority of the problems are fixed. 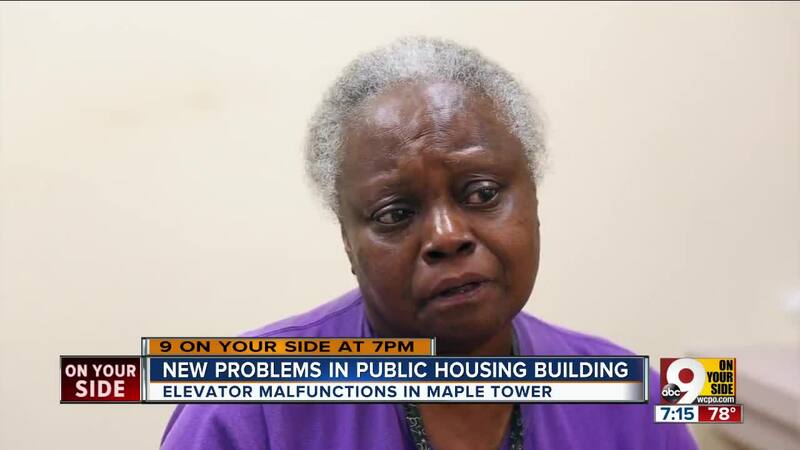 But residents told WCPO now there’s a new complication at Maple Tower: The elevators keep breaking down. 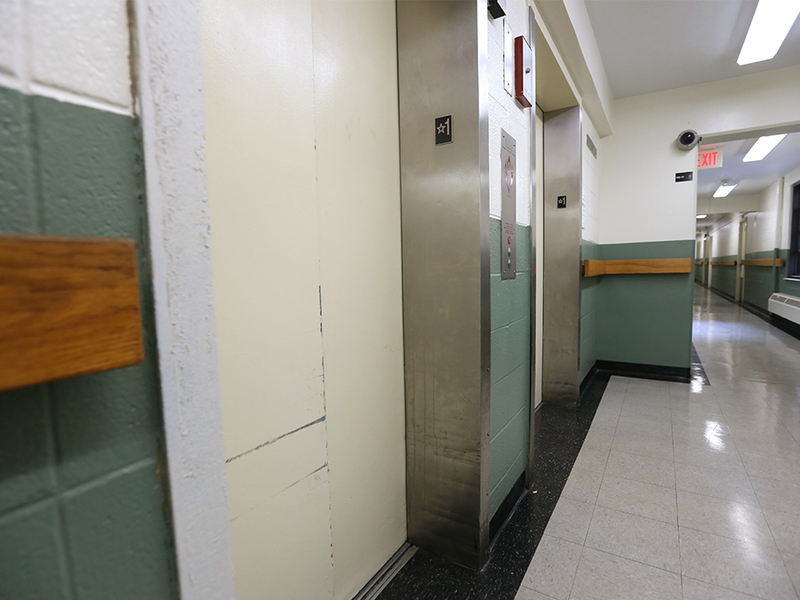 While that might not seem like a big deal, the elevator problems have had a major impact on residents of the low-income apartment building, especially those who use wheelchairs and walkers, said Yvonne Howard. Howard is a Maple Tower resident and president of the Resident Advisory Council for the government-subsidized high-rise, which is owned and operated by the Cincinnati Metropolitan Housing Authority . “A lot of them have been staying in their apartments because they’re afraid to get on the elevator,” said Howard, who said she recently got stuck on one of the elevators for about 20 minutes. Residents, who pay rent that is calculated based on their incomes, are missing programs at Maple Tower that are available to them, she said. It also has been more difficult for them to get the free meals that are served in the building’s basement. “Those who can climb the steps, they’ve been trying to take the meals up,” Howard said. “We’re not supposed to do that,” she added, but it’s better than having residents skip the meals completely. WCPO first reported about maintenance problems at Maple Tower in April as part of ongoing coverage of Cincinnati’s public housing. 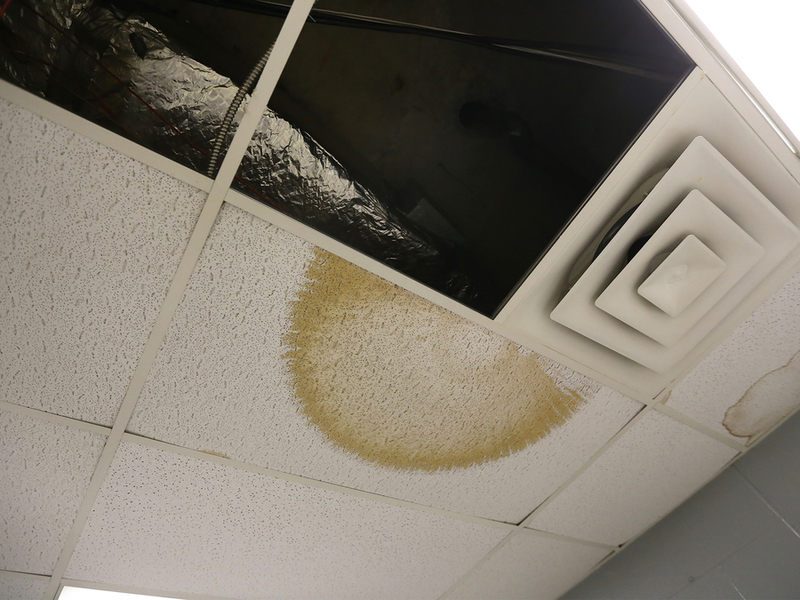 During three visits to the building in the first few months of this year, tenants complained mostly about plumbing problems that resulted in overflowing sinks that spilled water under cabinets, onto rugs and sometimes even into the hallways. A couple of weeks after that WCPO report, inspectors from the Cincinnati Fire Department, Cincinnati Health Department and the city’s Buildings & Inspections department scoured the building and found scores of violations. A CMHA spokeswoman said in July the housing authority had fixed the problems the inspectors found, but city officials could not confirm that because they had not been back to check. A city inspector went back to the property in late September and completed the re-inspection Oct. 2. The inspector noted three remaining violations in two apartments in a report dated Oct. 3. The housing authority’s understanding is that everything is fixed, Lesley Wardlow, CMHA’s senior communications coordinator, wrote in an email response to WCPO’s questions. “The latest communication from the City inspections says all are ‘completed’ or ‘resolved,’” she wrote. Repairing the elevators has been complicated because they are old, and sometimes parts are not immediately available, Wardlow wrote. Residents remain wary. They and their advocates said things seem to get repaired but then break again. Johnny Holschuh is a staff attorney for Legal Aid of Southwest Ohio . He represents a number of residents in the building who want CMHA to fix problems in a way that is more permanent. Reductions in federal funding are making it more difficult for CMHA to make all the repairs that are needed in its aging buildings, said John Schrider, the Legal Aid Society of Southwest Ohio’s director. But he said a lack of money doesn’t explain everything. Some of Howard’s neighbors said they’re still frustrated, no matter what the city’s latest inspections found. 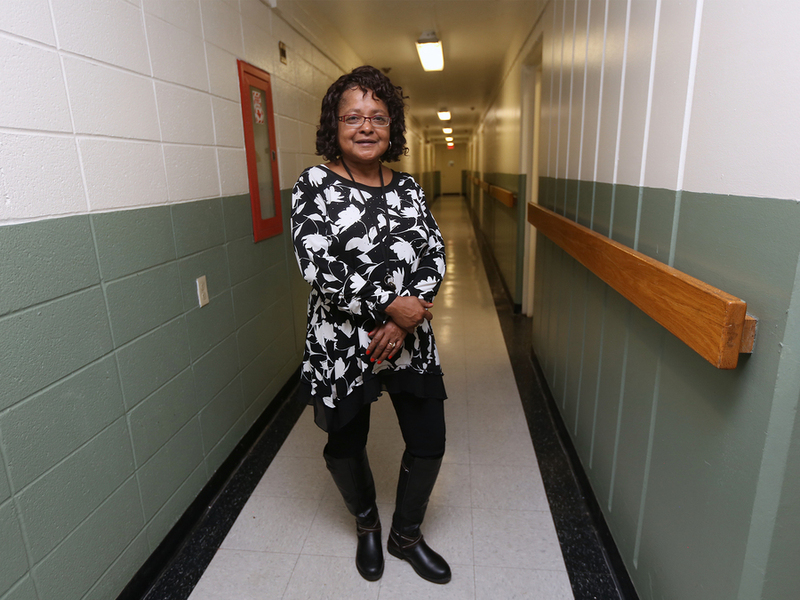 Sharon Stephens uses a walker and has trouble getting down the steps when the elevators aren’t working properly, she said, adding that she’s worried about how elderly and disabled residents would escape Maple Tower’s upper floors in the event of a fire. 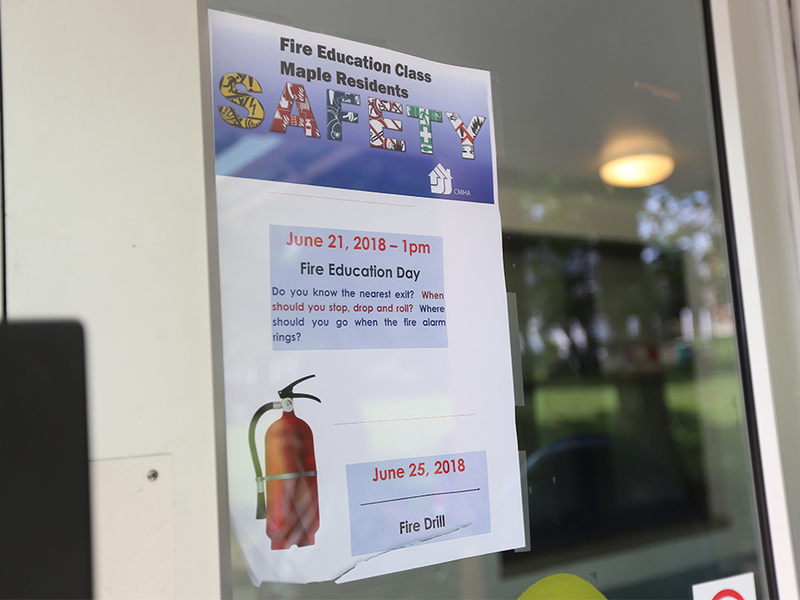 The Cincinnati Fire Department was supposed to offer a fire safety training this summer, but it never happened. Wardlow said Maple Tower’s property manager is working to reschedule it. Maple Tower resident Gary Terrell said it would be helpful for residents to practice evacuating the building in the event of a fire to give them peace of mind. Diamond Guerrero lives on the ninth floor of Maple Tower, and she said she doesn’t think the fire alarms on her floor work properly. The alarms went off in other parts of the building recently, she said, and she didn’t hear them. If residents have maintenance problems or concerns about their apartments, Wardlow said they should call CMHA’s work order center and file a work order. She has stressed to WCPO many times that the housing authority can’t fix problems it doesn’t know about. If the problems go beyond work orders, Wardlow said residents should talk to their property manager during scheduled office hours or attend their monthly Resident Advisory Council meeting. 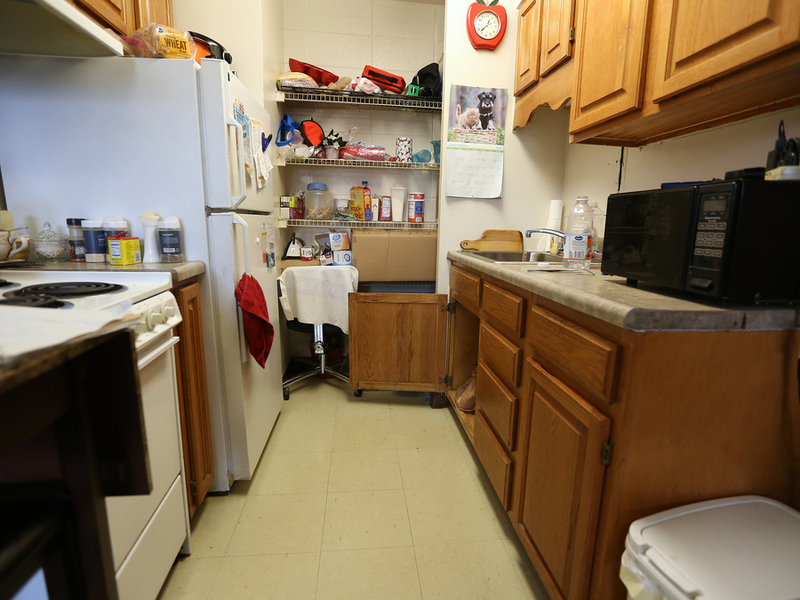 In the case of Maple Tower, residents also have a paid service coordinator to assist them. That’s Yvonne Howard, who said she has been helping residents the best she knows how by spotlighting their concerns and requesting the city inspections. Lucy May writes about the people, places and issues that define our region – to celebrate what makes the Tri-State great and shine a spotlight on issues we need to address. She and visual journalist Emily Maxwell have been reporting on Cincinnati’s public housing for more than a year. Their previous stories are available at www.wcpo.com/poverty . To read more stories by Lucy, go to www.wcpo.com/may. To reach her, email lucy.may@wcpo.com . Follow her on Twitter @LucyMayCincy.